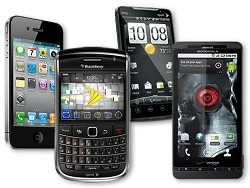 Smartphones are everywhere--which is surprising given the fact that they are all fairly expensive. Nevertheless, they are everywhere, so the question begs, what can you expect from a Smartphone. One thing you can expect with a Smartphone is a high-ticket price. They are crammed with technology--most of which is un-used by most people. Not every Smartphone has all of the features listed on this article, but most of the best Smartphones do. So if you are looking for the best Smartphones then you should expect some of these top features. Many of them have a very generously sized screen. Many have a great image resolution and display qualities that are years ahead of the mini-TV’s we used to buy just 15 years ago. The good ones are designed so that they will not slip from your hands, so that they are easy to use and so that you can easily carry them on your person. The best ones are going to have a camera that is at least 5 megapixels, and most of them are going to have a zoom feature. Many of the good ones will also have some form of photo editing software installed. The best Smartphones are going to have the ability to view more than one image type, and more than one movie file type. Their viewing platform will also be a modern one that has few/no bugs. The best Smartphones will have high quality speakers with a very clear sound. They will also have a very high quality microphone that will be able to pick up a multitude of noises from a large distance away. Most will have call waiting, hold, three-way and voice dialing features. Most modern Smartphones will have a battery life that is far longer than a tablet device. With moderate use--at Smartphone should last over two days and up to four days. You should expect at eight hours of power when using it solidly for those eight hours. You should not expect as much memory as with a tablet device, but the best Smartphones will have a lot of random access memory (RAM) and a lot of hard drive memory, so that you may store lots of movies, apps and songs onto it. It should have lots more memory than regular phones. Some of the best Smartphones now have 4G, so keep a look out for that. Smartphones are supposed to have accessory ports. The best ones will allow you to plug sophisticated accessories into your Smartphone. All Smartphones may use apps, but the best Smartphones will be able to handle large and sophisticated apps. They will be able to run computer games and large programs without slowing down or freezing. There are apps for things like calculators, but the best Smartphones are going to come with these sorts of things already installed. They are going to have tools and functions that are very useful in real life, so that you do not need to install them yourself. You should research into what sort of virus checkers your Smartphone comes with. The best Smartphones will come with some sort of virus and malware protection. Smartphones are not the most rugged technology on the market, but the good ones are shock proof and are harder to damage. The cheaper and poorly built Smartphones will break easily, especially if they are put under any force, where as the best Smartphones will need to be mistreated before they break. It is true that some of the best Smartphones are not the most well built, but as a rule, the best Smartphones are usually well built. For example, the new Samsung Galaxy Tab looks a little plastic and does not look well built (even though it is one of the best Smartphones), but most of the best Smartphones are well built. My name is Sonia Jackson. I represent the web-site writing research papers. We’ll help you to solve all problems with writing different essays and research papers in a short time; we’ll answer all your questions and give you useful advice.